The Disney Company has become a gigantic international corporation with a brand that’s recognizable everywhere. They do a lot more than create animated features and theme parks. It wasn’t always that way, however. Back in the early 1940s, Disney was struggling with finances and had just gone through a vicious union strike. World War II made it even tougher to function in the normal way, and Walt Disney and his animators spent most of their time on military projects. The exception was a series of “package films” — animated shorts that were much cheaper than releases like Pinocchio and Bambi. The first instance was Saludos Amigos, a 42-minute compilation released in 1942. It originated from a trip to Latin America by Walt Disney and a group of artists and other employees. Depicted in the documentary Walt & El Grupo, this trip inspired two pictures. The first release includes four short films that range between interesting cultural journeys and pretty standard comedy. Saludos Amigos feels awkward because there’s little connection between the shorts. The opener “Lake Titicaca” sends Donald Duck to the famous South American body of water for comic interactions with the residents and animals. It’s hard to dislike anything with Donald, even if he’s a little different than the current incarnation. The best moments in this film involve his exasperation at navigating this new culture. The finale “Aquarela do Brasil” introduces José Carioca, a parrot from Rio de Janeiro that gives Donald a tour of the area. 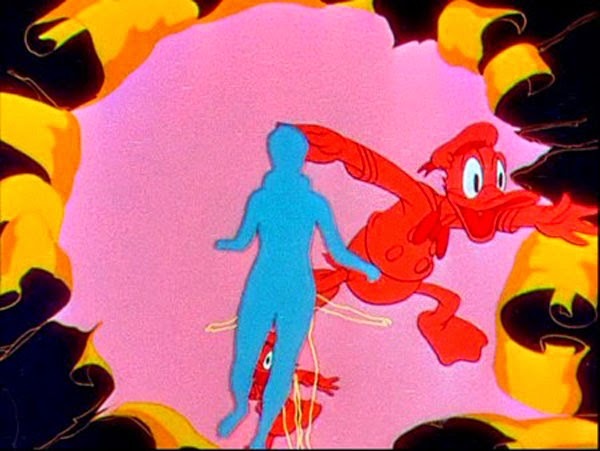 This lively segment uses the formula that would be employed to greater success in The Three Caballeros two years later. The music and dancing might paint a limited picture of life in South America, but there’s more energy than the typical animated material. 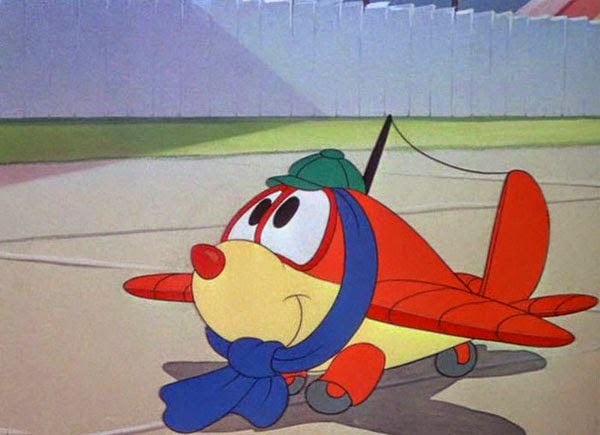 The lone segment that doesn’t involve a familiar Disney face is “Pedro”, which presents the first flight delivering air mail for the title character. This “baby plane” faces many obstacles, and they generate a few chuckles, but it’s hardly thrilling. It begins at an airport in Chile and feels like a missed opportunity. We do learn a bit about natural features of the country from the narrator during Pedro’s misadventures. The other entry is “El Gaucho Goofy”, a silly take on the cowboy. Goofy is an American that learns how to become a gaucho, and some laughs come from the comically inept character and his horse. It’s what you’d expect from animation at the time and is fun but not that memorable. 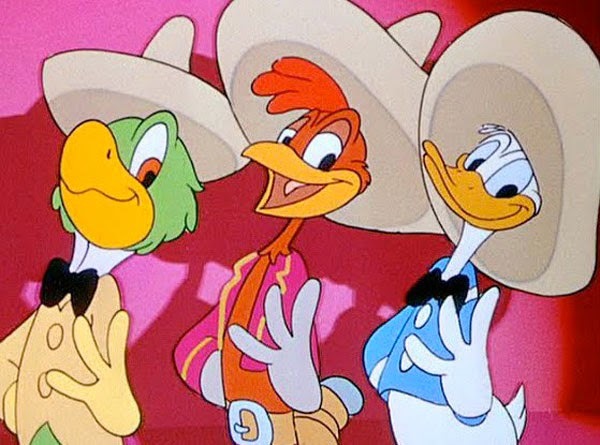 Disney returned to South America two years later with The Three Caballeros, a 72-minute film with six segments connected by Donald opening presents from friends. The early shorts are pretty standard and follow Saludos Amigos’ style in presenting South America. It opens with “The Cold-Blooded Penguin”, which shows how even a penguin wants to live there. He’s leaving his home to find the good stuff! A common theme is Donald’s obsession with women. In “Baía”, he re-joins José Carioca to explore the Brazilian state. He pines mightily for singer Aurora Miranda, and I couldn’t help but be reminded of Howard the Duck. The combination of live action and animation is rudimentary, yet it works for the most part. Donald gets jealous of a man with a guitar and does everything that he can to get Miranda’s attention. They’re really missing out on this side of his personality on Mickey Mouse Clubhouse. There’s also a creepy guy playing music with a pencil in his teeth. The final 15 minutes are what move The Three Caballeros into a different realm. First of all, Donald leads the trio to an Acapulco beach to chase after women hanging out in bathing suits. It’s meant to be endearing and the women enjoy it, but there’s a desperate slimy side to Donald’s behavior. This is just the beginning. Singer Dora Luz arrives to sing “You Belong in My Heart”, and the dastardly duck is desperate for a kiss. When he finally gets one, the film turns into a surreal reverie that might surprise some Disney fans. It’s closer to Fear and Loathing in Las Vegas than your usual Disney film. I’m not sure how this sequence inspires people to visit South America, but it’s quite entertaining. Seeing the Caballeros' heads with women’s legs beneath them is hardly the craziest moment. These films offered an interesting start to this marathon, which will tackle diverse releases from Disney in the 1940s. 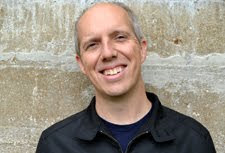 I’ll cover the work for the military, including Victory Through Air Power and other shorts. I’ll also catch up with package films like The Adventures of Ichabod and Mr. Toad that I haven’t watched since I was a kid. I’m not sure any will live up to the final act of The Three Caballeros. Will I see the Mexico boat ride at EPCOT in a new light? I’m amazed that fairly unknown characters still have a presence in the Disney parks. They provide fun moments, despite the questionable gender dynamics. I haven't seen those 2 films in years. I remember enjoying them as I thought it was colorful and seeing Donald in those situations made it hilarious. Donald is way over the top, and it's a bit surprising given how he's been marketed as a softer character in recent things by Disney like their TV show. I wasn't blown away but did find them interesting, especially after seeing Walt & El Grupo about the trip.